The SKB MC6 Waterproof Six Mic Case (Black) is designed to hold 6 microphones; 3 mics each stored horizontally in 2 separate layers of foam. It is a waterproof, injection molded case made from ultra high-strength polypropylene copolymer resin. 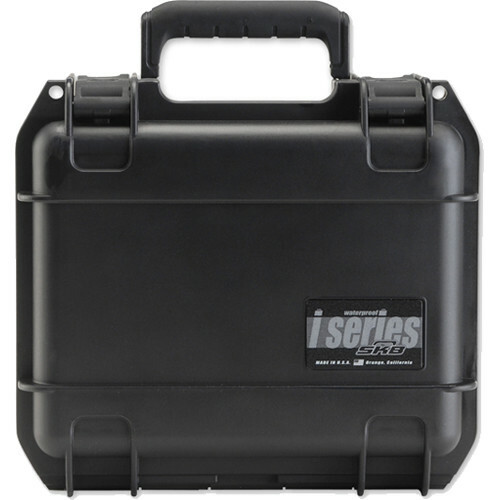 The case is resistant to corrosion and impact damage and has a gasketed, waterproof and airtight, submersible design. The interior has custom-cut foam padding and is cut on a water jet machine. The lid has convoluted foam for a compression fit. It also has an automatic ambient pressure equalization valve, continuous molded-in hinge and a trigger release latch system. The case is carried by a rubber over-molded cushion grip handle. Box Dimensions (LxWxH) 10.75 x 9.75 x 9.7"
MC6 Waterproof Six Mic Case is rated 5.0 out of 5 by 2. Rated 5 out of 5 by Guaco77 from Small and Hard I use this case for handling shure sm57 and 58 and its very small and useful to protect them by the way. I Recomend it becuase its hard, small and cute. Rated 5 out of 5 by the nicknamer from Best Mini Case on the Market great compact mini case! This is the case to get!